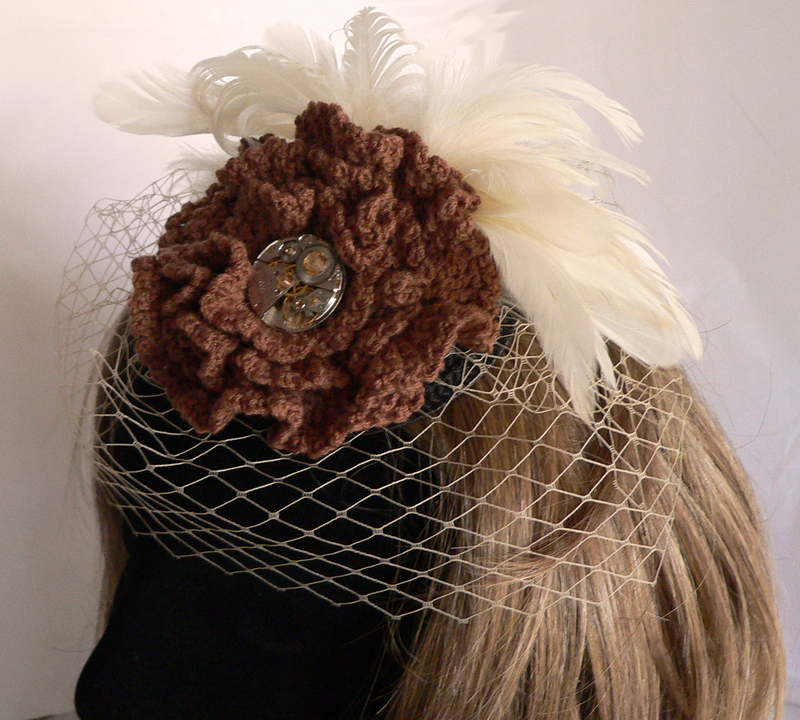 Fascinator with coquille feathers and Russian watch movement on crochet circle by Kai Joldeski. 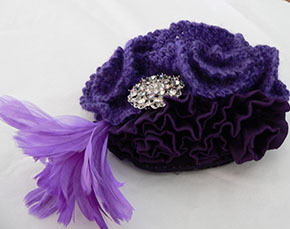 Occasionally I will make a hat, but I prefer fascinators as they can be worn to more occasions and destinations. I like to design one-off pieces, so they are completely individual for the wearer. I enjoy the creative experience and put a great deal of effort into creating different kinds of headwear. I do incorporate the usual embellishments like feathers, fabric, and flowers and I usually include something different like crochet, as an embellishment in its own right. I might also add a rhinestone for that final point of interest. I do tend toward an asymmetrical design rather than symmetrical, as this allows further scope and interest to a piece. I rely on old-fashioned techniques in my work, such as hand stitching and crochet. What is it about fascinators that’s so fascinating to women these days? I think it is the accessibility and the ease of wear. A hat is worn for a specific occasion or a specific outfit, whilst a fascinator can be worn as an alternative to a hat on such formal occasions as a wedding. Indeed, a fascinator can be a casual item (as jewellery for the hair) and you can also wear a fascinator to work or even to the supermarket. What’s hot in fascinators this fall? I am influenced by the traditional browns and beiges in my fall series with a splash of black. Also, I’m working on a new Steampunk range. Describe your customer. Who is she? What’s her style? 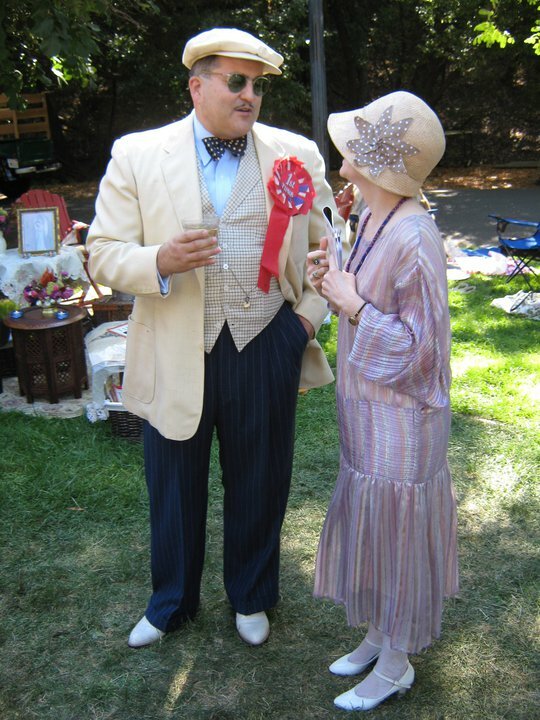 Someone that wants individuality – which is found with my one-of-a-kind pieces and for those who want something based on these fashions: Art Deco, Victorian, Steampunk, Individual. Everywhere, really. Sometimes it’s just the shape of a feather, or a colour found in a fabric. Sometimes a design shapes itself based on what the crochet or other embellishment brings in the process. If you were to design a fascinator for Catherine, Duchess of Cambridge what would it be like? Anything would look fabulous on Kate, but if I did have that privilege I would create something in red with my signature crochet embellishment, lots of curly nagorie (feather pad) and a statement feather of Lady Amherst (black & white) to finish it off. Do you wear fascinators? What’s your fave? I wear something every day, usually one of my combination pieces (hair clip and brooch in one) because of its duality and ease of wear. My favourite piece is this purple number (pictured right). Thank you, Kai. Your work is truly unique and just the way we like it. Image courtesy of November Films. Way before H&M there was BIBA, a hip London boutique in the 1960s. Conceived and managed by husband and wife team, Barbara Hulanicki and Stephen Fitz-Simon, BIBA put London on the fashion map by offering reasonably priced modern and stylish clothing for young women. Along with Mary Quant and Twiggy, BIBA is now a fashion icon of 1960s London and lately there has been renewed interest in BIBA and Barbara with the documentary by November Films, Beyond BIBA: A Portrait of Barbara Hulanicki. 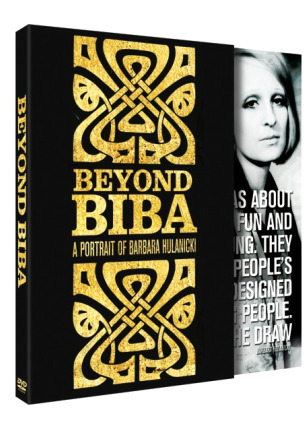 Beyond BIBA: A Portrait of Barbara Hulanicki uses family photos, old film clips, and interviews with Barbara as well as former BIBA employees and business associates to share Barbara’s story as a fashion designer/businesswoman and later an interior decorator in Miami. Sporting a blonde pageboy and large black glasses, Barbara speaks openly and modestly about her life and career while she takes the viewer around Miami, her studio, and her apartment. This film is a visual feast of vintage BIBA and Barbara’s imaginative aesthetic, which was heavily inspired by all things Art Deco. Each interview is set against fantastic museum-like backgrounds of books or curios and the interviewees are stylishly dressed in striking prints, outlandish hats, and black nail polish. Viewers will want to watch this film again and again, not just for the enjoyment of the visuals but also to catch every bit of Barbara’s compelling life story from her exotic childhood to the magical creation of BIBA and then its sad demise and finally her career as an interior designer. Beyond BIBA is a must see for any fashion student, designer, artist and/or lover of Art Deco. Take a look for yourself and share with friends. 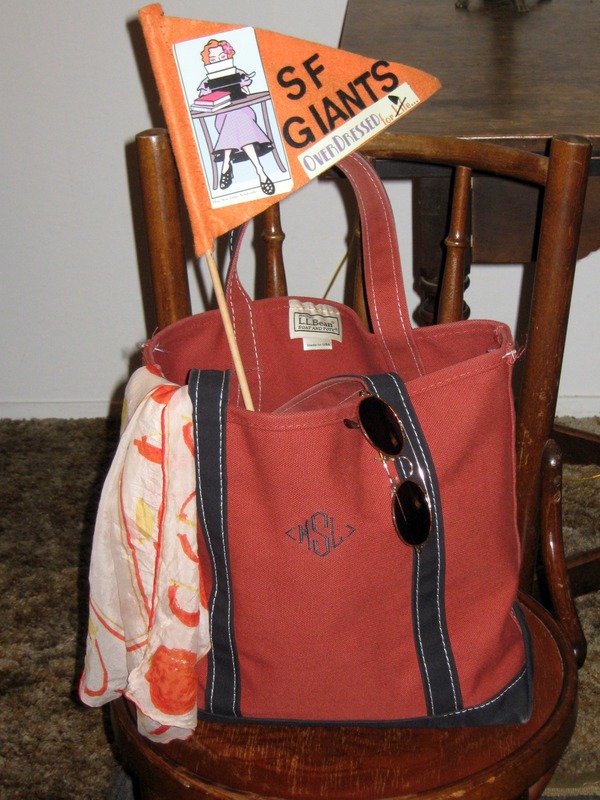 The LL Bean Boat & Tote goes well with a Giants game. “What does a girl wear to her first baseball game?” I asked, waving the two free Giants tickets in the air like a pennant. Well, I knew for sure what tote bag would be appropriate. 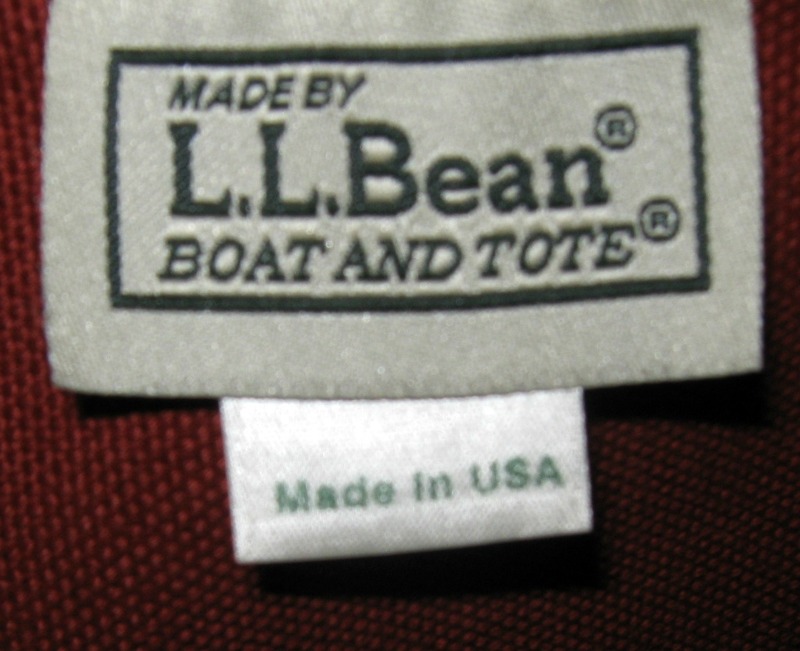 My LL Bean Boat and Tote. I’ve had this bag for a few years and it’s great for a trip to the city, the library, to the park, picnics, anywhere. 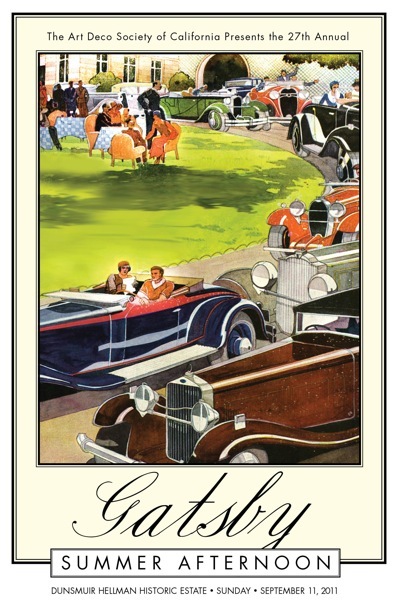 It’s a classic look that fits well in urban and suburban environs. The Boat and Tote was inspired by ice carriers back in 1945. In the 1960s LL Bean started offering the cream bag with contrasting red or blue trim. All these years later it’s a true American classic, still made from 100 percent cotton in Brunswick, Maine. Now we have an array of options in size, color, and monograms. As for my first baseball game … I enjoyed roaming the vast ballpark, seeing a double play, and cheering on the team. The game went 14 innings and ended with The Giants beating The Padres, 6-5. But, most importantly, my custom-made pennant survived the entire evening of enthusiastic waving. Original outfit by Kiss of the Wolf. Photo by James Young. As a working girl, I don’t have much of a chance to shop. But I always make time for the annual American Craft Council show coming up August 12-14 at San Francisco’s Fort Mason. I have to admit one of the reasons I enjoy the ACC Show is because my sister-in-law, Lori Bacigalupi, is one of the 230 artists showing her wares. Lori’s business is called Kiss of the Wolf and using hand painted batik and shibori fabrics she creates chic women’s jackets, dresses, blouses, skirts, vests, and scarves. Each piece is custom-made and designed to work together, allowing customers year after year to build an entire wardrobe of Kiss of the Wolf. Lori’s designs successfully blend ease with elegance. Kiss of the Wolf is a family business started by Lori and my brother, Marshall, in the 1970s. It was way cool for me as a teenager to be able to say, “Yes, that’s right, my brother is a fashion designer.” It was even better each Christmas and birthday when I opened large boxes containing another Kiss of the Wolf original. When I was in college, I would occasionally go on the road to help with the shows. I have fond memories of hanging out with Marshall in the studio while he painted fabric and recently it was an honor for me to model some of the new designs. It’s now a tradition every August for my mother and me, and sometimes friends, to make our way over to the ACC Show and see Kiss of the Wolf in action. But don’t think we stop there. Handcrafted wood handbag by Denise DeRose. Photo courtesy of The American Craft Council. As I mentioned there are 230 artists from around the country showing the best in handcrafted jewelry, clothing, accessories, fine art, and home decor. We spend the day and shop thinking ahead to holiday gifts. 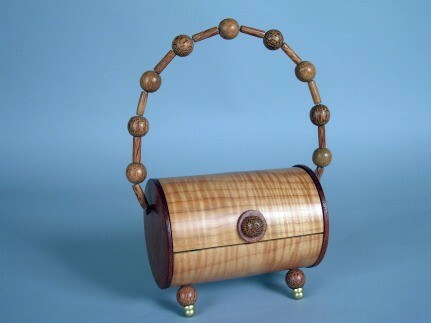 I allow myself one treat and this year I have my eye on Denise DeRose’s wood handbags. One-of-kind, handcrafted and made in the USA. The American Craft Council Show has it all. This year is extra special as the ACC is celebrating 70 years. Check it out and make sure to stop by and see Lori at Kiss of The Wolf (booth # 319). Tell her Over Dressed for Life sent you. The American Craft Council Show, August 12-14, San Francisco, Fort Mason. Click here for more information.